Redwood and Douglas fir forest, featuring old growth redwood trees. The Methuselah Tree is one of the very few remaining old growth redwood trees. I went for this hike with Midpeninsula Regional Open Space District’s docents Fran Keeler, Huey-Shin Yuan, and Mary Brunkhorst (Scenic Aerobic Hike II). In all, there were ten hikers. It was a brisk-paced hike with no planned rest stops. 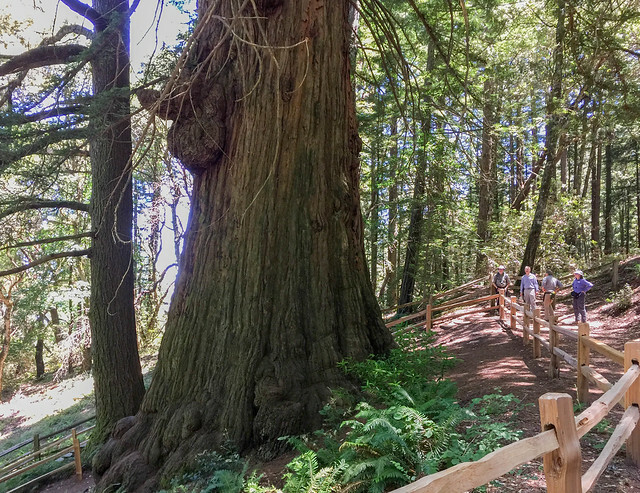 This is a great place to go to in the summer months to enjoy a leisurely hike in the shade of redwood trees. Compared to other open space preserves, this place is a more complicated maze of numerous crisscrossing trails; one can easily get lost if the route is not planned in advance or if not carrying a map. This preserve is frequented by many hikers and cyclists on week days. The sight of the Methuselah Tree was absolutely fascinating. One can avoid all the hiking and just drive up to the spot – it is off the Skyline Blvd. Parking Lot: El Corte de Madera Creek Open Space Preserve parking lot with ample parking space. There is some cellular reception inside the preserve.